Mix the flour, sugar, baking powder and salt in a bowl. Combine the milk, yoghurt, butter and egg, pour into the flour mixture and stir until you have a smooth batter. Heat a little clarified butter in a wide-bottomed, non-stick frying pan. Reduce the heat. In batches, add enough batter to the pan to make 3 round and 3 oval pancakes approx. 6 cm in diameter and another 3 round and 3 oval pancakes approx. 12 cm in diameter. Once the undersides are cooked and no longer stick to the pan, turn the pancakes over, finish cooking, then keep warm. Place 1 large round pancake and 1 small round pancake slightly overlapping each other on a plate and dust with icing sugar. Use blueberries for the eyes and buttons. Position the apple peel like a scarf, finish with the marzipan nose. Twist each slice of bacon and place on an oven tray lined with baking paper, dust with icing sugar. Bake: For approx. 15 mins. in the centre of an oven preheated to 180°C. Place 1 large pancake and 1 small pancake slightly overlapping each other on a plate. 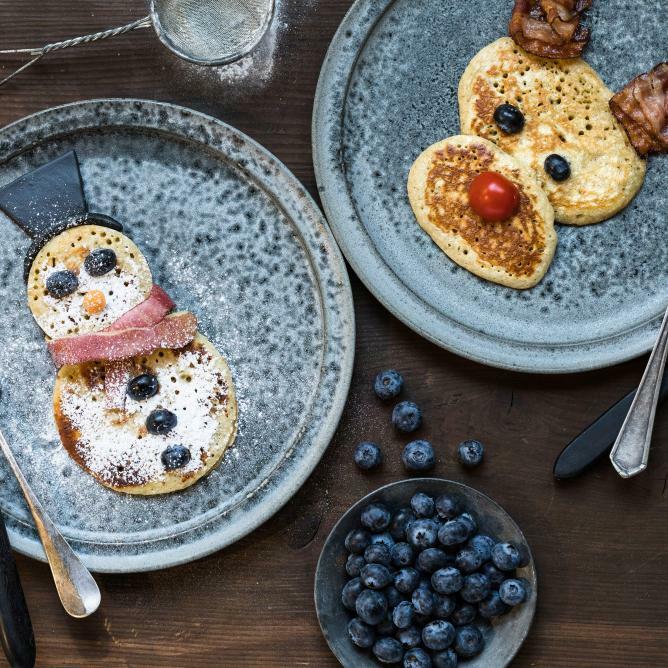 For each reindeer, place 2 slices of bacon for the antlers, blueberries for the eyes, and cherry tomatoes for the nose on the pancakes.